We welcome children and families five days a week. Tuesday - Friday: 9:30 a.m. to 3:30 p.m.
Creative ideas come alive as children and families use special big blue blocks to make and build whatever their minds can imagine. From time machines to castles, motorcycles to kitchens, children take the lead as they innovate on one another’s ideas. Children and families can explore South Africa’s night sky together inside our portable planetarium, supported by a Play Africa facilitator who will introduce basic vocabulary and indigenous stories about the stars that have been through the ages. Afterwards, children illustrate what they have learned. Children and families create art side by side using a range of art materials and open-ended art activities. Everyone is encouraged to express their creativity and try new things while exploring new tools and techniques and creating beautiful masterpieces. Storytelling help children make sense of their world. They are linked to South Africa’s important oral cultural traditions. At this exhibit children develop language and communication skills to help build a their sense of well-being, identity and sense of belonging. Children naturally dream and imagine. 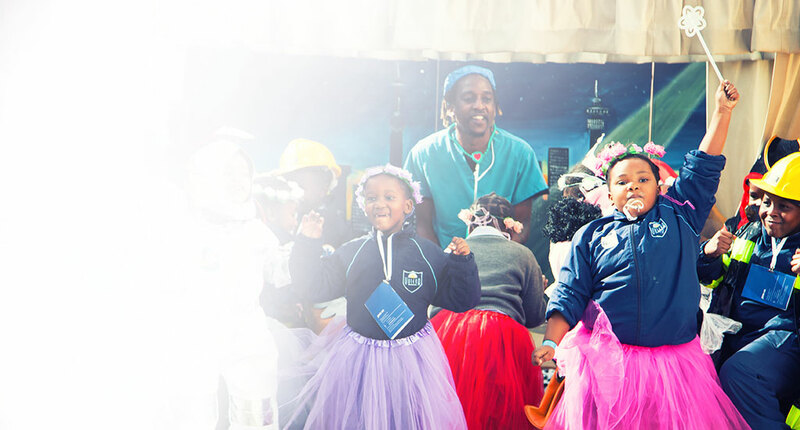 At Play Africa’s Fantasy Play, they can bring their stories to life through dress-up and pretend play. Fantasy Play nurtures abstract thinking, which is necessary to process ideas, consider theories and determine consequences before acting. This space helps children build important social skills and negotiate with one another while they experiment with new roles. This exhibit is designed to stimulate the minds of our youngest engineers, our children. Children experiment, design, test and adapt their own marble run to learn about basic physics and engineering. Children can access this learning at multiple levels with endless options and challenges. Hands on Maths is an interactive experience that encourages children to develop early maths confidence and understanding in an exciting and engaging environment. Children and their caregivers use a range of craft materials to create incwadi yothando, or “love letters,” to the people and things that are important to them. This exhibit nourishes the introspective nature in children and families. In this station, children work with local artists to paint self-portraits. Together, the self-portraits will form part of a collaborative work of art created for Play Africa to send a message of welcoming and belonging to all who visit. In this station, children and families can pose for a family photograph in Play Africa’s Children’s Taxi. Those who choose to share these photographs with Play Africa can see their photographs showcase in Play Africa’s “All Families are Welcome” exhibit. Children and families will make a movie through stop-motion animation. In this station, everyone takes turn making new marks on a single canvas, taking pictures throughout the process. At the end, the images of the evolving image are used to make a movie. Play Africa’s Children’s Maker Space is an open-ended exploration space where children are encouraged to plan, make and experiment using a range of exciting materials and tools. This large-scale building kit for hands-on free play and playful STE(A)M learning lets children use wooden planks, wheels, pulleys, nuts, bolts and rope to follow their curiosity through play while learning 21st century skills. Play Africa has a range of Lego and Duplo for formal and informal maths, engineering and fantasy play programmes, thanks to an innovative partnership with Care for Education and the Lego Foundation. Children create their own city and railroad system with a range of materials. Chlidren use a wealth of materials to learn about the natural world and their place in it. Children learn about environmental conservation and the Earth’s climate with hands-on environmental science activities. This programme sets the stage for children’s healthy cognitive, physical, emotional and social development, providing parents with education on appropriate, loving stimulation for children from age 6-14 months. We champion children’s right to play, explore, discover and connect. Through our original exhibits and programmes, we are inspiring the next generation of South African creators, makers, innovators and inventors. Thanks to our donors, we serve ALL children and families. We are building dynamic play and learning spaces where children and families can come together to experience the transformative power of play. Major public institutions for hands-on play and learning existing around the world and are sometimes known as ‘children’s museums’. They offer young children powerful learning enrichment outside the formal classrooms of schools and crèches. More than 31 million people around the world visit these kinds of spaces every year.